I am pleased Oscar Quine draws attention to the fact 24% of PRUs are judged 'outstanding' by Ofsted compared to 11% of mainstream provisions. As much as I think Ofsted judgements are simply one measure, and in an ideal world shouldn't be viewed as the be-all and end-all, I hope it goes some way to challenging stereotypes that these places are 'youth clubs' rather than important educational provisions. The truth is it's not like this. The way I describe behaviour in a PRU when asked is that it is in fact ordinarily much calmer than most mainstream schools (this is deliberate, as many of our students have sensory sensitivity) - but the speed with which students become stressed is much faster and the way students then express their state of distress can be, occasionally, more extreme. The truth also is, yes, the students I work with do come from complex backgrounds - sometimes it feels like you are 'wading through darkness' as you unpick particular situations. But again, most pastoral staff in mainstream schools will be able to identify at least a dozen students with similar stories. Perhaps the difference in a PRU is the intensity. To work in a PRU, you definitely need a level of emotional literacy and resilience matched with a sense of perspective, a sense of humour and a sense of mission - it's not a job you can ever just show up to and go through the motions (which teaching job is?). But to speak plainly, in a well-led provision, the job is not any harder than mainstream teaching. Oscar Quine observed my lesson and noted in particular the lack of behaviour issues - which he puts down to my ability to engage the students. This is high praise, I guess, from an outsider and somebody clearly skilled (as a journalist) in observing people and situations. But this should not be judged as a reflection of my individual skill as an entertainer or enforcer - what it in fact reflects is the wider culture of our alternative provision. > There is a focus on Social, Emotional and Mental Health Needs (SEMH) rather than Social, Emotional and Behavioural Difficulties (SEBD) - this shift in terminology has taken place nationally now but at the Pendlebury Centre, it has been an real and ever-present ethos for the past twenty or so years. Recently, it has manifested in a significant investment in the Duke of Edinburgh Award, with a view to providing opportunity for students to achieve a well-respected alternative award for their CVs but, crucially, also with a view to actively broadening horizons and building resilience (see here for a good report on this aspect of education). > There is a well-kept balance around 'behaviour management'. There is a compassionate perspective on 'acting out behaviours' - understanding the individual has an unmet need - alongside an assertive stance that the wider school community requires protection. What this looks like, in practice, is the use of a consistent, graduated and communication-focused behaviour policy. We don't make excuses for unacceptable behaviour but nor do we take a simplistic view that 'these kids just need sorting out' through overly-punitive measures. > There is a high expectation around achievement and a pressing focus on the future for our students. 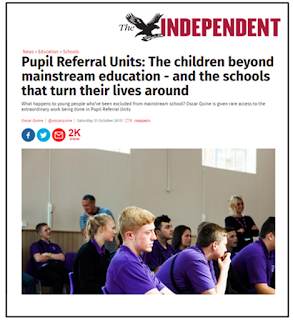 This involves strong partnerships with mainstream schools, to enable students to access a wider variety of subjects and, wherever possible, keep our students engaged and experienced in 'mainstream life' - because the reality is this is where roughly 95% will eventually end up longer-term. This also involves, in the PRU, a constant focus on learning - from detailed assessment to unpick how our students learn (and identify any underlying difficulties) matched with, as Oscar Quine notes, engaging and productive lessons. > Finally, there is a strong focus on working with families through multi-agency working - that the job doesn't start and finish at the school door. There is ongoing liaison with CAMHS, social care and other agencies. We also are fortunate to have a very good PCSO. This work is relentless and it has to be, as there are no quick fixes. What you will note is that these things are in many ways 'common sense' and are not things that cannot be undertaken by a mainstream school - and it's clear from my previous work experiences and through continuing contact with mainstream colleagues, that many mainstream schools are doing this already. It is work that can't always be measured in the way governments would like (see here for a good critique of this) - but those of us working at grassroots level, seeing first-hand the breadth and depth change that can take place in young people, it's a big part of what helps us get up in the morning.